Overview & specs of C.K Tools 120 Lumen Bright IP64 Rated Small Compact LED Head Lamp Torch Flashlight by Electrical World. 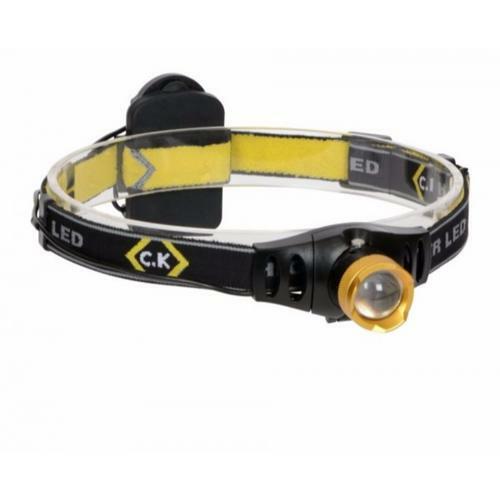 The C.K T9610 is a compact & lightweight yet versatile, high performance LED Flashlight Head Torch ideal for Electricians, Plumbers, Joiners and general tradesmen along with runners. ** This product has been discontinued by the manufacture, C.K. The closest alternative is the C.K 200 Lumen Rechargeable Torch. ** High power Output Torch featuring 120 Lumen CREE XR-E Q3 LED. Beam intensifying plano-convex optical lens is used to produce the high intensity beam with a massive 200m range. One-handed Rapid Slide Focus mechanism (RSF) for a single handed spot (x1) to flood (x7) beam control. Adjustable head lamp swivels through 90° and a focusable beam. 3 Lighting modes for versatility: High (120 Lumen), Dimmed (30 Lumen) and Flash (120 Lumen). Dimmed mode avoids the risk of dazzle and reduces reflective glare. The flash mode acts as a personal safety signal which is particularly useful when running in low light conditions. Manufactured with a Robust high grade Aluminium body and drop resistant up to 1 Meter. IP64 Rated making this torch resistant to Water and Dirt. Lightweight and Compact measuring 165x175x95mm and weighing only 83g. Long Battery Life, up to 5 Hours on High Output or 13 Hours on Dimmed Output. Requires 3 x AAA Batteries (Not Supplied). Guaranteed for life for imperfect materials or workmanship from the manufacture, Carl Kammerling International. Please also see the C.K LED 8 LED Inspection Light or the C.K 150 Lumen Hand Torch. We are comparing prices for C.K Tools 120 Lumen Bright IP64 Rated Small Compact LED Head Lamp Torch Flashlight in new condition sold by Electrical World.